The Vegas Golden Knights advanced to the Stanley Cup final on Sunday, eliminating the Winnipeg Jets with a 2-1 win in Game 5 of the Western Conference final. A group of players nobody wanted — the self-proclaimed 'Golden Misfits' — are heading to the Stanley Cup final. 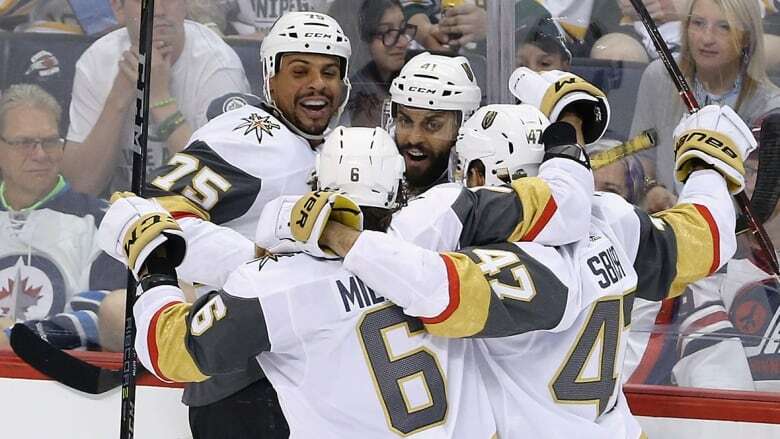 Ryan Reaves scored the game-winning goal, Marc-Andre Fleury made 31 saves and the expansion Vegas Golden Knights continued their improbable run by defeating the Winnipeg Jets 2-1 on Sunday to win the best-of-seven Western Conference final 4-1. A franchise that had just two players under contract at this time last year before filling out the rest of its initial roster with castoffs from the league's other 30 clubs in the expansion draft, is now just four wins from hockey's ultimate prize. "Everybody on this team has something to prove," said Reaves, a tough guy acquired from the Pittsburgh Penguins prior to February's trade deadline. "We call ourselves 'The Golden Misfits' for a reason. "We're doing a good job of proving everybody wrong." After the Jets cancelled out Alex Tuch's opener later in the first period, Reaves tipped home Luca Sbisa's point shot for his first goal with Vegas to silence the white-clad crowd at Bell MTS Place with 6:39 left in the second. A Winnipeg native, Reaves didn't see action in the playoffs until the clincher of the Knights' 4-2 series victory over the San Jose Sharks in the second round. His last goal before Sunday came 3½ months ago while still with Pittsburgh, but the 31-year-old's unlikely contribution is just the latest example of a team with an incredible work ethic finding a way. "The guys that weren't playing, myself included, we stayed ready," said Reaves, who munched on a couple slices of pizza before fielding questions from reporters. "We had fun while we were doing it, but we worked hard so when we were called upon we were ready to go." The Knights lost Game 1 of the series in Winnipeg before ripping off four straight victories where they never trailed to become the first team since the St. Louis Blues in 1968 to advance to the Cup final in its inaugural campaign. "Everybody's stepping up at different times," said Fleury, the face of the franchise since Day 1. "That's a big reason why we've been playing consistently." Vegas will meet either the Tampa Bay Lightning or the Washington Capitals in the Cup final. Tampa Bay leads the Eastern Conference final 3-2, with Game 6 set for Monday in Washington. "It's insane," said Knights defenceman Deryk Engelland, who grabbed the Clarence S. Campbell Bowl after the final buzzer to celebrate with his teammates. "Your goal [at the start of the season] is always to make the playoffs. But if I were to guess I would be sitting here doing this right now, you would be a little skeptical at the time. "It's been an amazing ride. We just want to keep it going now." Josh Morrissey replied for the Jets, who got 30 saves from Connor Hellebuyck. Winnipeg will head into the summer bitterly disappointed after falling short of its goal, but the franchise just hitting its stride gave fans a taste of real playoff success after so many tough years. "It's very difficult to find that positive feeling at this moment," head coach Paul Maurice said. The old Jets were swept in their only two trips to the second round of the playoffs before leaving town in 1996, while this incarnation lost in four straight in its only appearance in 2015 after moving from Atlanta in 2011. "It was their time," Winnipeg captain Blake Wheeler said of the Knights. "They're just playing really well. "You have to give them all the credit." Down 2-1 after 40 minutes Sunday, Winnipeg got a power play early in the third, but couldn't muster much of anything. The Knights smothered much of the Jets' attack for the next 10 minutes, with Hellebuyck having to come up with some big stops to keep his team within one. Winnipeg pressed with under four minutes to go, with Fleury stopping Wheeler on the doorstep, but it wasn't nearly enough as the Knights closed out their third straight series on the road. "So proud," Vegas centre Jonathan Marchessault said. "We kept going, we battled." The Jets beat the Knights 4-2 in Game 1, but Vegas snatched home ice with a 3-1 victory in Game 2 before picking up 4-2 and 3-2 wins at T-Mobile Arena to take a commanding 3-1 series lead. The Knights, whose jaw-dropping inaugural 109-point campaign included a Pacific Division crown, swept the Los Angeles Kings in the first round before the San Jose Sharks succumbed in six games. The Jets, meanwhile, had the NHL's second-best record with 114 points in the regular season. They advanced to the conference final with a five-game defeat of the Minnesota Wild in the opening round before topping the Presidents' Trophy winning Nashville Predators in Game 7 on the road. "It was a hard series," Marchessault added. "L.A., San Jose, great teams, but Winnipeg ... from the forwards down to their goaltender, it's just an amazing team. On paper one of the best teams out there. "All those records and everything, it doesn't mean anything if you're not the last team standing ... I think we have a lot of gas left."